Schnuck Markets has agreed to acquire 19 Shop ‘n Save supermarkets in the St. Louis market from Supervalu Inc.
Financial terms of the deal, announced late Monday, weren’t disclosed. Schnucks and Supervalu said the sale of the stores — 14 in Missouri and five in Illinois — will be staggered and start on Oct. 7. The transaction is expected to close in late October. Also under the deal, Schnucks will acquire four of Shop ‘n Save’s seven fuel centers as well as 16 Shop ‘n Save pharmacies. Fifteen of the pharmacies are inside Shop ‘n Save stores, and the other is a stand-alone pharmacy in Union, Mo. Schnucks is also buying the prescription files for 10 other Shop ‘n Save in-store pharmacies and will transfer those prescriptions to nearby Schnucks stores. 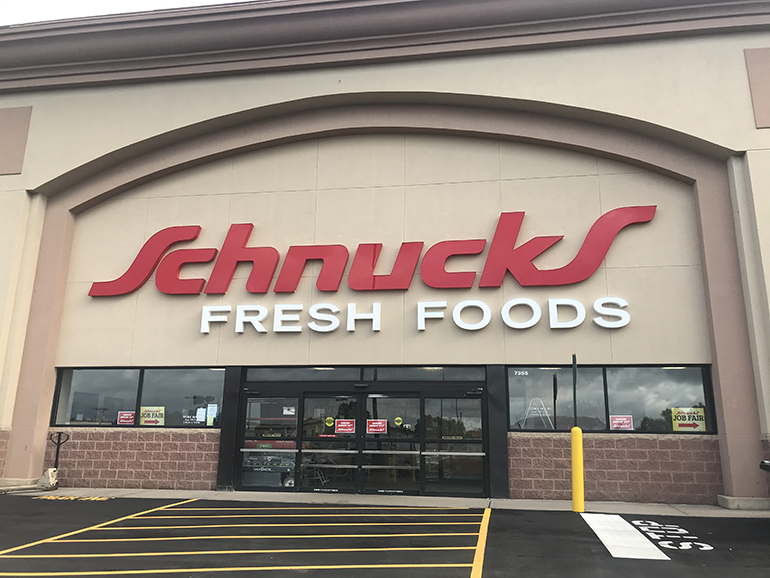 In connection with the sale, Schnucks also has entered a primary distribution agreement with Supervalu for nine current Schnucks supermarkets in northern Illinois, Iowa and Wisconsin. The Shop’n Save locations and pharmacies will be converted to the Schnucks banner. Schnucks said it expects to close each store about two-and-a-half days for the conversions, which include posting new signs and fixtures, switching out point-of-sale systems and restocking merchandise. Plans call for all bargaining-unit Shop ‘n Save employees to be offered jobs with Schnucks at the same wage rate, working a comparable number of hours and doing comparable work, Schnucks said, adding that eligible employees will also get health care coverage and pension contributions consistent with union agreements. Over the next week, Schnucks is slated to interview all Shop ‘n Save store directors, assistant store directors, pharmacy managers and pharmacists. When the acquisition closes, Schnucks will have 118 supermarkets, 110 pharmacies and nine specialty pharmacies in Missouri, Illinois, Indiana, Wisconsin and Iowa. Schnucks last month opened a new store — a former Shop ‘n Save — in Maplewood, Mo., and the retailer is currently building a new store in Warrenton, Mo., that’s scheduled to open later this fall. For Supervalu, the sale to Schnucks furthers plans to exit the grocery retailing and focus on growing its wholesale business as part of United Natural Foods Inc., which in late July announced a deal to acquire the Minneapolis-based company for $2.9 billion. That transaction is expected to be finalized in the fourth quarter, pending regulatory and shareholder approvals and other closing conditions. The 17 remaining Shop ‘n Save stores will operate as usual as Supervalu seeks one or more buyers, but the company said it will close the stores later this year if no purchasers are identified. Founded in 1979, Kirkwood, Mo.-based Shop ‘n Save has about 2,800 employees and has served the St. Louis market area for nearly 40 years. Supervalu noted that it also plans to close its distribution center on Hazelwood Avenue in St. Louis later this year. The facility, which mainly serves Shop ‘n Save stores, is slated to remain in operation until the completion of the sale to Schnucks and any sales or closures of the remaining Shop ‘n Save locations. The sale of Shop ‘n Save leaves Supervalu with 111 supermarkets under the Cub Foods, Hornbacher’s and Shoppers banners. Supervalu had announced plans to divest Shop ‘n Save in May, after unveiling deals to sell 21 Farm Fresh stores to Harris Teeter, The Kroger Co. and Food Lion the previous month. In August, Supervalu shareholders approved a plan to adopt a holding company structure to facilitate the sale of the retail assets.